"What if Superman were Michael Myers?" Sony Pictures has unveiled the first full-length trailer for a sci-fi superhero film titled Brightburn, a new film from director David Yarovesky. Produced by James Gunn, the film is being described as "a startling, subversive take on a radical new genre: superhero horror." It's a bit like the famous comic Superman: Red Son - what if a child from another world crash-landed on Earth, but instead of becoming a hero to mankind, he proved to be something far more sinister? Elizabeth Banks stars, with David Denman, Jackson A. Dunn, Matt Jones, and Meredith Hagner. This, of course, also reminds me of Chronicle, which also played with the idea of what if a superhero wasn't a good person. And from the first look at this footage, I am more than intrigued. Consider me entirely sold on this already. What if a child from another world crash-landed on Earth, but instead of becoming a hero to mankind, he proved to be something far more sinister? With Brightburn, the visionary filmmaker behind Guardians of the Galaxy and Slither presents a startling, subversive take on a radical new genre: superhero horror. 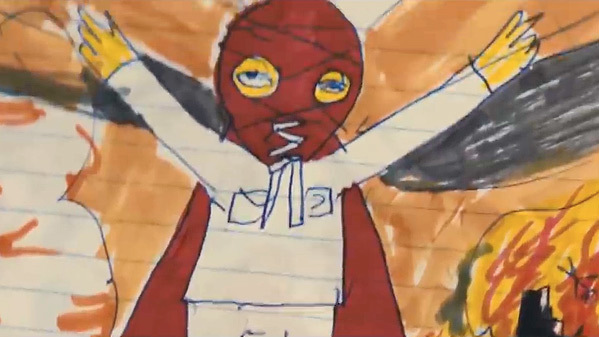 Brightburn is directed by up-and-coming filmmaker David "Yarvo" Yarovesky, his second feature film after directing The Hive previously, as well as some short films and music videos. The screenplay is written by Mark Gunn & Brian Gunn; and it's produced by James Gunn & Kenneth Huang. Sony will release Yarvo's Brightburn in theaters everywhere starting May 24th, 2019 next summer. First impression? Who's down?